a kind of Mobius trip. Welcome along. Or perhaps if any of these messages are yours, welcome back! Sometime in the mid 1970s, while thumbing from a highway on-ramp in rural upstate New York, on the light pole I am standing beside I casually notice some graffiti—messages evidently scrawled by hitchhikers who had come before. Fast-forward to the summer of 1992 in Las Vegas, Nevada. Now married, with kids and a “real” job with a big-name company, I'm carving out a good life; yet, one also consumed by the day-to-day, week-to-week, hand-to-mouth conditions that turn one year into the next. But thoughts of those graffiti on that light pole are slowly seeping from my subconscious and pooling into a reservoir of irresistible curiosity within me. Wondering if that had been just a fluke observation all those years before, I break from my normal routine and pull down an I-15 on-ramp in the far south end of the Las Vegas Valley to check out the light poles where I predict hitchhikers might strategically position themselves for the best chance to flag rides. Much to my pleasant surprise, one of these poles contains a few messages. 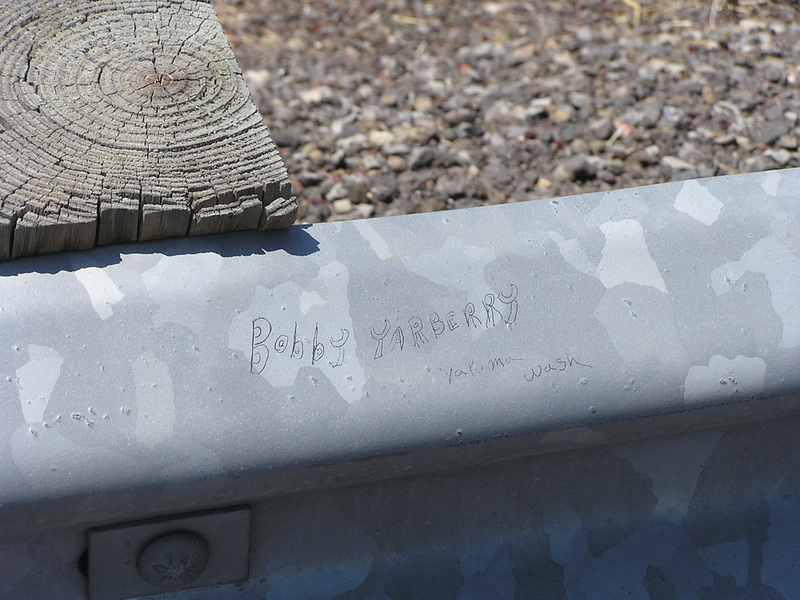 And while these inscriptions, in and of themselves, are not particularly inspiring, they become the catalyst that sets into motion my quest to seek out and log down hitchhiker graffiti on lamp posts, signage, guardrails, and other highway hardware, first around Southern Nevada and the desert southwest, and then wherever else in North America I happen to find myself.